Much has been said about setting good goals, but not enough has been said about designing an effective structure for our goals. If you’ve dipped your toe in the sea of productivity advice, one of the first things you’ll learn is to set goals. But the advice tends to stops there. It would be as if you wanted to get in shape and someone said “exercise.” That’s not particularly helpful, is it? Someone armed simply with the advice to “set goals” may make themselves a goal like “Grow my business to $100,000 monthly revenue in one year” and start chipping away at it. This is a fine start, but it lacks structure. It lacks clarity on how to pursue it. 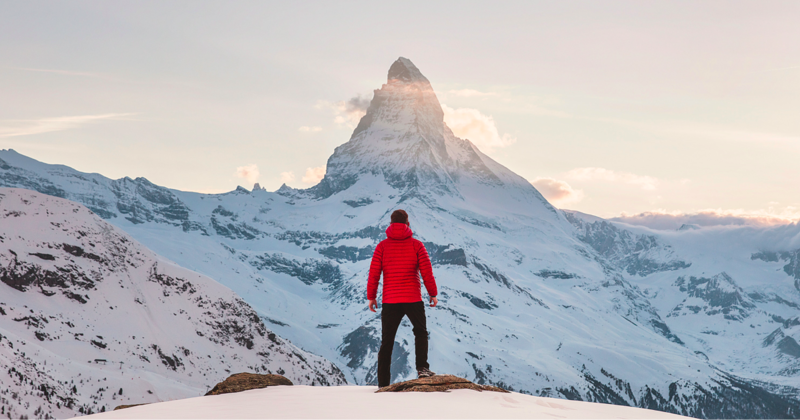 Goal setting is not enough–what we need is a reliable system for clarifying big life goals, and then breaking them down into manageable pieces. Pieces where you know exactly how you’re tracking against the bigger, meta-goal, and where you know exactly what you need to do each day in pursuit of that greater goal. Since I started exploring the area of goal setting five years ago, I’ve experimented with as many systems as I can get my hands on. Some strategies have been more effective than others, and over time, I’ve whittled it down to a system that works exceptionally well for me. A system that lets me maintain a consistently high output towards my goals while avoiding spinning my wheels on short-term projects that won’t contribute to the greater vision. I’ll start with an overview of the three levels of the system, then explain exactly how to implement each level into your life. At the end, you’ll have a step-by-step guide for figuring out what you want to pursue over the long term, and how you can best direct your daily, weekly, and quarterly efforts in pursuit of that vision. I’ve also included a free goal setting template to help you with this, which you can get a free copy of here. We tend to overestimate what we can do in the short term (days, weeks, months), but underestimate what we can do in long-term(years). This happens because our output and growth experience compounding interest in the same way a good investment strategy does, but humans are only good at thinking linearly. Imagine that you could improve your personal output at a modest 1% per week. In 13 weeks (one quarter), you would linearly predict to have reached 113% of your current output. But since each improvement compounds on the last one, you would actually be at 113.8% of your current output. No big issue here. Your ability to predict your output in 13 weeks linearly is close to what would actually happen exponentially. If we extend this to a year, though, you start to diverge. You would predict that you’ll be producing at 152% your current capacity, when really, you’ll be at 168% (10.5% higher than you predict). Again, not a huge issue. But if we extend it to ten years, you would predict you’ll be at 620% your current output, when really, you’ll be at 17,665%! 28.5x as much as you think you will be able to produce. You’d be able to do in two weeks what you think will take you a year. Obviously, certain things can’t increase that much: words written, code written, sales calls made, etc. but the productive results of your time spent could certainly go up that much, and if you try to set 10-year goals based on linear projections (which is all our feeble minds are capable of) you’ll dramatically undershoot just how far you could get. All of this is to say that you don’t need to worry too much about making precise goals beyond three months. You should have grown enough in three months to make any longer term goals in need of updating. It’s certainly good to have some vision of where you want to be in the long term, but it doesn’t need to be a meticulously defined goal. Just a guiding ideal. This provides a good mix of long term goals at the quarterly level, and short term goals at the daily and weekly level. Some people do monthly goals, but I haven’t found them useful. Monthly planning doesn’t work with weeks since you’ll end up doing your monthly plans halfway through a week. As long as you keep your quarterly goals in mind, and have some intermediate checkpoints within your weekly goals, you don’t need defined monthly goals. Especially at the daily level, there will be other things you have to do besides your “big three” but by picking the three main goals that will have the biggest impact on your weekly and quarterly goals, you avoid falling into the trap of responding to what’s urgent instead of doing what’s important. I’ll also mention that if you run a business, it can help to do a separate version of this for yourself and for your business, so that you don’t use all of your goals on what should be company goals. Here’s how my planning goes at each level in more depth. The objective of setting my quarterly goals is to figure out what my three primary goals for the next 13 weeks should be. They provide the high-level roadmap that ensures I’m working towards important outcomes every day and week. To do that, I work through a questionnaire that helps me identify what went well the last quarter, what didn’t, what my bigger longer term goals are, and then what I can do in the medium term to pursue them. It updates some each quarter, but it roughly follows a format like this. First I figure out what worked, what didn’t, and how I should adjust my thinking for this quarter. Go through my top accomplishments from the last quarter (as recorded in weekly reviews), pull out the most significant ones. What am I most proud of accomplishing? What were my quarterly goals, did I hit them? Why or why not? What were the big impediments to hitting my goals this quarter? What was I wrong about? What mistakes in thinking or foresight can I learn from? Do I need to adjust any of my long term goals? Do I need to delete any of them? Do these goals still make sense? Are these still important goals to me? Then I’ll take some time and see what else I should add to the list. These can be life goals, fitness goals, financial goals, personal goals, business goals, anything that I think I want in the 1-25 year time horizon. What do I most want to have accomplished 1, 10, 25 years from now? If it’s 1-5 years from now and I’m wildly successful, what most likely led to it? What does my ideal day look like? What’s missing right now? Once it feels like I’ve recorded everything and refined it, I’ll start to choose what I want to focus on. Which of these goals is the most exciting? Which goal would I want in my eulogy? Which goal am I most afraid of pursuing? Which goal would open me up to other goals I’m excited about? Most increases my future options? Which goal would I pursue if I had unlimited time and money? Which goal contributes most to my longest-term visions? I’ll keep using these questions until I have a good idea of which three big goals I want to focus on for this quarter. With the three long-term goals selected, I can figure out what my outcomes should be for the quarter. For each goal, I make myself define a clear success metric, a yes/no sign if I hit it. This helps make them into SMART goals and gives me a clearer sense at the end of the quarter of whether or not I’ve hit them. Goal 1 Success: Finish the first book draft, do one round of edits, and send to 10 people by January 1st. 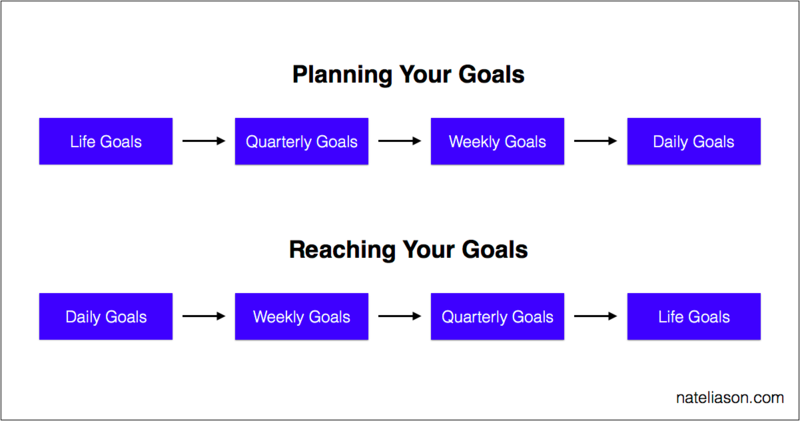 You can structure the goals however you want, and you can add intermediate 4 and 8 week goals, but the most important part is that you have a clear success indicator. If you make an abstract goal like “get in shape” you’ll never know if you did it. If you’re reading this and it’s the middle of a quarter, go ahead and do a plan for the rest of this quarter and then do a full one at the start of the next quarter. It’ll still be helpful for getting a more macro view. The quarterly goals are the guides that let me figure out what I should be doing on a weekly and daily basis. 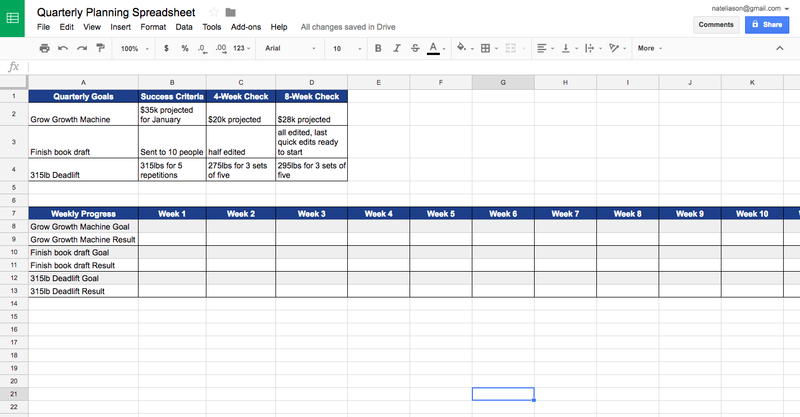 Then depending on the goal, I’ll create a rough game plan for hitting the goal within 13 weeks. Then each week, I do a “weekly review” where the objective is to pick my top three goals for the week and put them in my goals worksheet. It usually takes less than half an hour to do the goal portion of my weekly review, and I’ll usually do it on Sunday evening before or after dinner. First, I go through my current quarterly goals, last week’s weekly goals, and make any adjustments. Review Quarterly Goals, do they still make sense? Are they on track? Review my habits. Is everything still on track? Do I need to correct course on anything? Are there any firebreaks that indicate I’m off the rails? What looming issues can I fix now? The goal of this step is to figure out if I need to fix anything on the systems level and the quarterly goal level. Is my life getting off the rails (sleeping in, drinking more, eating badly, etc.) and needs to be fixed? And are my goals too high, too low, or in need of a better plan to be reached? Once that’s done, I can do a more targeted assessment of the past week. Next I figure out how the last week went from a more micro view. Go through last week’s top goals, how did I do? If I missed any, what went wrong? How can I avoid those errors this week? If things went well, how can I keep doing that this week? How else can I improve my track towards my goals? Finally, I can pick what my top three goals for the week should be to move me towards my quarterly goals. And just like the quarterly goals, these should be structured around clear outcomes that tell me if I’ve succeeded, not abstract results. Growth Machine Weekly Goal: Pitch three potential new clients on Content Machine projects. Then I can do my first daily goal setting of the week, which I do every evening after I’m done working for the day. Finally, we arrive at setting goals for the day. I do this every evening when I’m done working, or on the off chance I don’t get to it one evening, I’ll do it first thing the next morning. First: It forces me to put a time constraint on the focus. I only have so many hours in the day, and there will be other tasks that crop up, so constraining my thinking to an hour per goal lets me focus on the 20% of possibilities that will bring 80% of the results. Second: It ignores anything I’ve already done. Sometimes there will be a clear roll-over from the previous day, but sometimes you have to start fresh because the actions that will move you closest to the goal has changed. Third: By focusing on getting closest to the goal, I think broader than just checking off to-dos and ask what other ways can I reach the goal. Sometimes you’ll find that a change in circumstances lets you accomplish your weekly goal in a day, letting you put more work in other areas or get ahead on next week’s goals. You don’t want to think in terms of doing ⅕ of the weekly goal each day. You want to think in terms of what could potentially complete the goal today. Once those three goals are selected as part of my broader evening review, I’ll plug them into my task manager (Things) and tag them with the “Top” priority. This way when I wake up, I can just look at my tasks for the day tagged as Top priorities and do them before doing anything else. For daily goals, it helps to think more in terms of “action steps” than “outcomes.” Over a quarter you might want to grow your business by $13,000, but that doesn’t necessarily mean you should target $1,000 a week. As you get closer to the daily level, you want to focus on the actions you can control, rather than the outcomes you expect them to lead to. By completing those daily goals, I know I’m doing the most important things to move towards my weekly goals, which are the most important things for moving towards my quarterly goals, which move me closest to my broader goals. The grand, 1-25 year vision is tied directly to my daily focus, and I never have to wonder about why I’m doing something or what I should be focusing on. These will all be parts of the continuing series on designing a high-output life, which you can learn more about here. This is a living article and I’ll keep updating it as my system evolves. It was last updated in November, 2017.